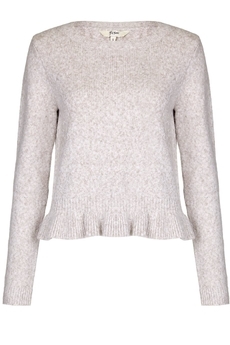 Yumi London, Frill Hem Sweater in soft-in-touch mid-to-heavy knitted fabric is simple and chic with an on-trend frilled ribbed hemline. Has round neckline, long sleeves and is approx. 58cm in length. It simply slips on. Winter collection. Composition: 61% Acrylic 19% Polyester, 19% Cotton, 1% Elastane. Color: Ivory.